SAVE $3.00 OFF YOUR NEXT OIL & FILTER CHANGE. $3.00 off regular price of Oil & Filter Change. Oil, and Filter Change. Tire Rotation, Visual Brake Inspection, Multi point inspection, and Exterior Car Wash. Coupon not valid with any other offer. Must present coupon at time of purchase. Limit one coupon per person. Coupon does not apply to prior purchases. Other Restrictions may apply. Void where prohibited. Some models slightly higher. $15.00 WITH FREE INSTALLATION FOR FRONT WIPER INSERTS. ADD $7.00 FOR VEHICLES WITH REAR WIPER. DID YOU KNOW THAT APPROX 70% OF VEHICLES ON THE ROAD TODAY ARE OUT OF ALIGNMENT? LET US PERFORM A FREE CHECK OF YOUR VEHICLE'S ALIGNMENT TO SAVE YOU MONEY IN THE LONG RUN. Service includes: Oil and filter change, Spark plug replacement, Engine valve adjustment, Tire rotation, Brake inspection, Engine coolant change, Multi-point Inspection, and Complimentary Exterior Car Wash.
Includes Timing belt replacement, and inspection only of water pump, cam and crank seals, tensioner, and drive belts. most models. Coupon not valid with any other offer. Must present coupon at time of purchase. Limit one coupon per person. Coupon does not apply to prior purchases. Other Restrictions may apply. Void where prohibited. includes timing belt replacement only. 5% OFF ANY RECOMMENDED MAINTENANCE OR REPAIR ON YOUR NEXT VISIT. Discount taken off of full retail price. Coupon not valid with any other offer. Must present coupon at time of purchase. Limit one coupon per person. Coupon does not apply to prior purchases. Other Restrictions may apply. Does not apply to oil or miscellaneous charges. Void where prohibited. Tired of paying high prices to service your Acura? We now offer the same great service and value our Honda owners enjoy to Acura owners. When you first drive your brand-new Honda vehicle off the lot, you might think that's the end of it. The truth is that if you want your car to last, you need to take proper care of it. The technicians in our service center are here to help you out with that. Everyone in our service center is an expert on everything Honda-related, and they're here to help you keep your Honda vehicle running as smoothly as the day you first drove it home. Honda models are some of the most reliable on the market. However, while they are reliable, they aren't invincible, and they still need regular maintenance to help undo everyday wear and tear. 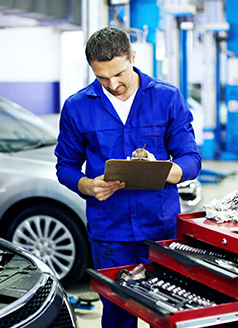 Routine auto maintenance is necessary for any vehicle, and that includes Honda models. At Joe Morgan Honda, we're here to help you keep your vehicle in shape, and to help you save money while you do it. That's why we're proud to offer our rotating selection of auto service specials. Before you schedule an auto service appointment, make sure to check our service specials to see if you can save. We know that sometimes people neglect proper auto care because they're worried about the cost. The truth is that auto maintenance helps you save money in the long run because it helps stop major problems before they occur. Auto maintenance helps you save money, and our auto service specials help you save even more. If you see a special you like, why not use it? Schedule an appointment with our service center today. We believe in making auto service as affordable and as convenient as possible. Just give us a call at 866-563-6674 to get in touch, or pay us a visit at Joe Morgan Honda, right here in Monroe, OH.